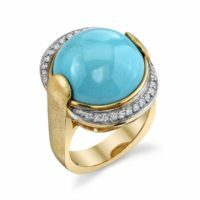 Handmade 14kt yellow gold ring featuring a Turquoise cabochon of 13.64ct set off with .23ctwof round brilliant Diamonds. The shank features a hand brushed finish. This is a Jorge Adeler custom design.